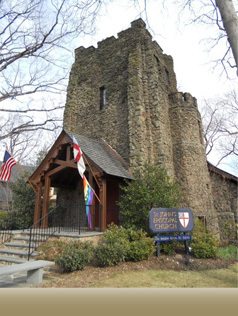 St. John's is at 55 Montclair Avenue, at the corner of Chestnut Street, Montclair, New Jersey 07042. For geeks, our coordinates are 40°49'11.7"N and 74°12'23.4"W.
From the South on the Garden State Parkway: Take Garden State Parkway North to Watchung Avenue Exit 151. Make left at end of ramp. Go 1.4 miles West to Montclair Avenue (2nd block after Grove Street traffic light). Turn left onto Montclair Avenue and go 0.7 miles to Chestnut Street. Church is at corner, on the left. From the North on the Garden State Parkway: Take Garden State Parkway South to Watchung Avenue Exit 151. Make right at end of ramp. Go 1.3 miles West to Montclair Avenue (2nd block after Grove Street traffic light). Turn left onto Montclair Avenue and go 0.7 miles to Chestnut Street. Church is at corner, on the left. From the East on Route 3: Take Route 3 West to the Garden State Parkway South. Continue on Garden State Parkway South, following above directions. From the West on Route 46: Continue on Route 46 East in the right lane joining Route 3 (after Montclair Via Valley Road Exit). Take the first exit for Grove Street. Turn right at the end of ramp. Go South 2.7 miles to Chestnut Street (3rd block after Watchung Avenue traffic light). Turn right and go 2 shorts blocks to Montclair Avenue. Church is at corner, on the right. From the West on Interstate 80: Take Exit 53 East (Routes 46 & 3-Lincoln Tunnel Exit). Continue on Route 46 East, following above directions.